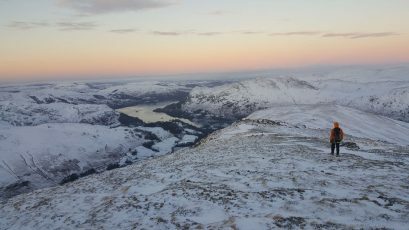 The first club trip of 2018 saw 19 enthusiastic club members heading up to Patterdale to stay in the always popular George Starkey hut. Al and I had been watching the weather forecast and social media posts all week – every day the weekend forecast and conditions seemed to change – cold dry alternating with wet and milder. 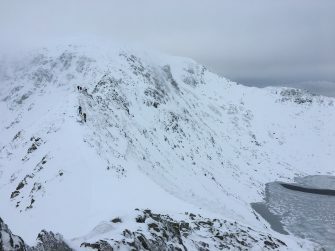 There was an avalanche down a gully on Helvellyn on the Thursday and we knew there had been a lot of snow so conditions would not be as last year’s winter Lakes trip that saw several groups rock climbing and mostly a complete absence of ‘winter’ (see blog post from 2017). 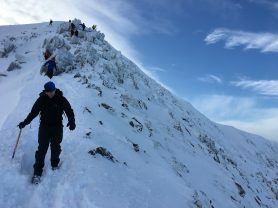 There was email, WhatsApp and text chat between those going with groups and pairs planning climbing and mountaineering days out, and a number of newer members keen to experience the best that the Lakes have to offer in full winter conditions. 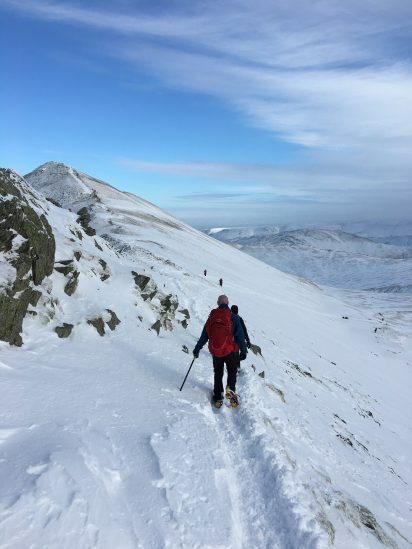 Dave, Glyn and Nick and Harry & Dan headed up early for an extra day of hill fun, enjoying full days out around Fairfield, experiencing deep snow and windy summits on the Friday. The rest of us departed Bristol at various times from Friday afternoon into the evening; the snow started falling as we approached Windermere – we managed the Kirkstone pass, stopping to help dig a driver out of a carpark – presumably they’d parked in the morning before the white stuff started falling and hadn’t counted on the amount, luckily for them another 4×4 driver got to their aid and we were free to carry on down the ever increasingly slippery hill to the hut, trying to find enough phone signal to text those coming up later to avoid the pass as we were sure it would be shut / impassable in the not too distant future. Sure enough, an hour and half after we arrived, Dave et al traipsed in post a long hill day – they’d got to the pass about 20min after us, but had to turn around and do the long diversion back up the motorway to approach from the North. 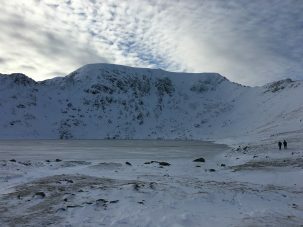 Plans were consolidated, excitement at the prospect of full on mountaineering days on Helvellyn raised, with cautious optimism at the weather forecast, and hope that the fell assessors report from Thursday indicating big impassable cornices on Swirral edge would have changed by Saturday. Those arriving later were advised of the 7.15am prompt start for those keen on the Hellvelyn day out, ear plugs were dug out (at least in the boys room) and the fire stoked to keep warm til the next day. Saturday morning saw bustling activity from 6.30am onwards. Four teams headed out – Joe, Rob and Harry had a big route planned on St Sunday crag and Helvellyn, James and Al were hopeful of some technical climbing on Dollywagon Pike, the girls headed north for a day on Blencathra leaving a big team heading up Striding edge, aiming for Helvellyn summit and either a descent down Swirral edge or longer walk across to Raise. 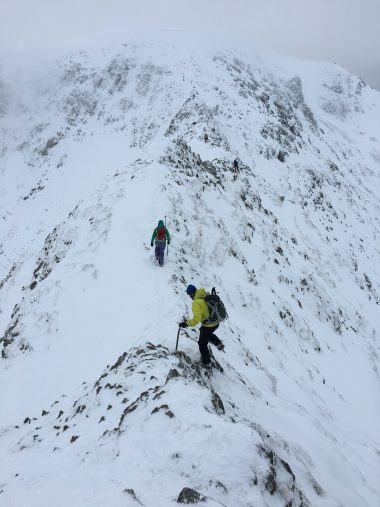 A large group of about 9 of us decided to do Striding Edge and, as the advice was to avoid Swirral Edge if the visibility was poor due to there being significant cornices when assessed on Thursday, to take the long route back via Raise and down to Glenridding. I took Henry, Paul and Phil in my car over to Glenridding, ahead of the others, who had drying up duties to perform at the hut, but due to my not listening to anyone there was some confusion about where we were meeting. After half an hour or so hanging around the Glenridding car park we decided to walk back down the road and go up via the traditional diagonal path to the ridge. 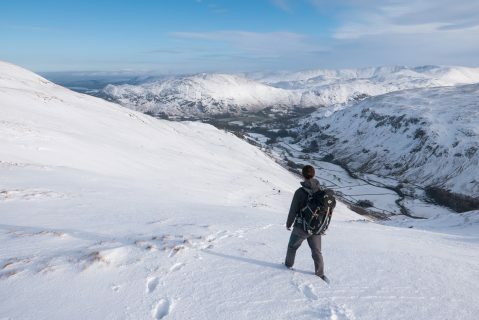 The snow was powdery in places but the path delivered fantastic views of the Grisedale valley. When we arrived at the Hole In The Wall we were delighted to meet Harry and the rest of the other group, who’d come up in worse snow conditions from the other side. We were less pleased to encounter another group of loud manly types who seemed to be stoned and who set off ahead of us. We added another layer as it was blooming cold, and donned helmets as the conditions were…interesting. The ridge was pretty claggy with a little bit of wind, and as consistently challenging as ever, but the clouds seemed to lift higher as we continued along it. 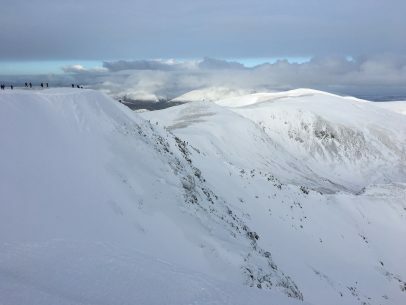 We stopped at the notch below the final steep snow slope up to a dubious-looking cornice as the even more dubious stoners clambered up there, broke their way through it and then proceeded to stand on the edge while their mates joined them. A fag packet rolled down the slope and passed us but thankfully nothing heavier than that. It was actually a really great exposed position to be in and the cornice was more solid than it looked from below, and as we stepped through and up towards the summit the skies began to clear and we were confronted with magnificent views for miles, no wind and a superb situation in the sun. 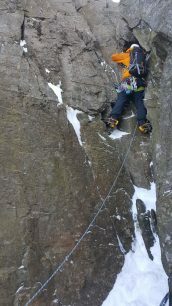 We met Al and James up there, who had given up trying to do a dangerous mixed route on Dollywaggon Pike. Our descent felt longer than it might have been, due to the thick powder snow, though it has to be said that Henry, who’d become our natural leader, decided to take us straight down the slopes for a bit of fun. At times we were wading through powder snow up to our thighs but it certainly was fun…for three of us at least. We had amazing views of Ullswater, and of the sun breaking through some clouds looking towards St Sunday crag across Grisedale. Our resident wildlife expert Harry had this to add about the furry creatures encountered en route. 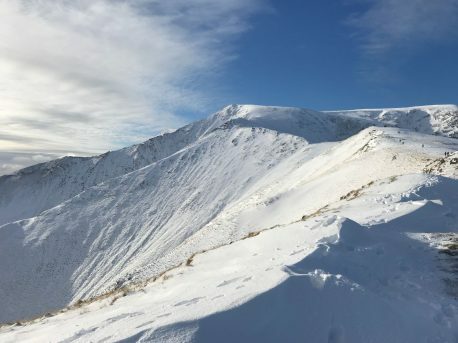 We were standing on the very top of Helvellyn when Dan pointed to something scurrying around in the distance being followed by a couple taking videos of it on their phones. It appeared to make a beeline for the shelter walls at the top which gets used by people having lunch, whereupon it was fed by all and sundry. 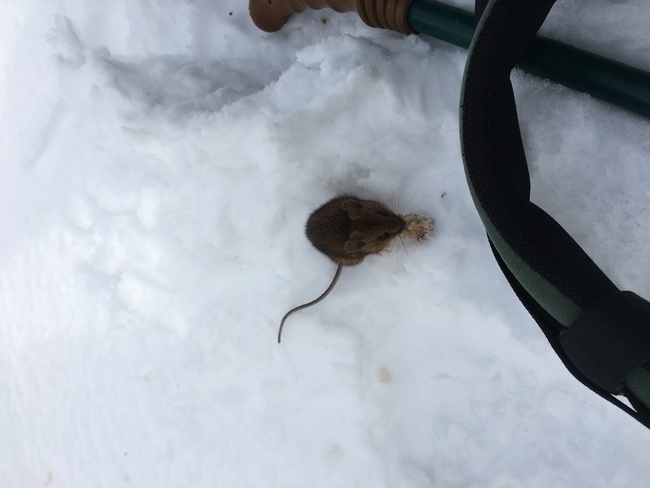 I would expect mice to be numerous and still active under the snow, inhabiting the crevices in piles of rocks and among the buried heather but we were right at the ice-blasted top of the hill where you’d think this would be impossible. Unless he was a stowaway in someone’s flapjack filled pack?? He looked quite determined so possibly he has cottoned on to the fact that the richest pickings were to be had right at the top so it would be worth making a daily commute up striding edge and over the cornice… I just hope he didn’t become raven food. 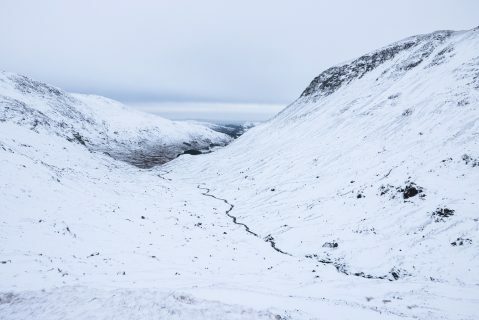 When we descended via Grisedale I also found some droppings from either a polecat or a pine marten (less likely but both interesting for the Lakes – and both mouse-eaters) and when we were walking through a beautiful silent snowy woodland near the end we followed fresh badger tracks for about half a kilometre via two kissing gates. Plenty of animals still about despite the weather! Team Pinnacle Ridge had an early start on the Saturday, stumbling through the dark to begin break trail up to the route. 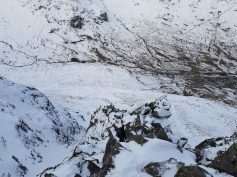 We had high hopes for the day and thought if we moved fast we’d have time to come back via Striding Edge. 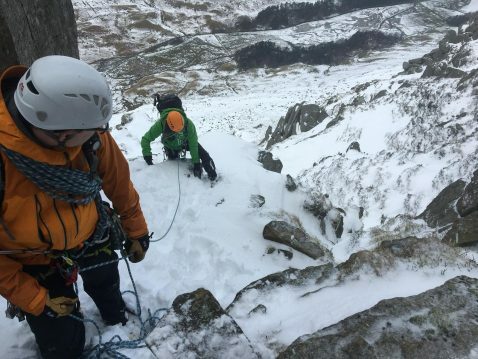 Alas it took us a few hours just to wade through the thick snow up to the traverse along the base of St Sunday Crag, and with ever increasing amounts of graupel. It’s wasn’t long into the route when we realised the inefficiencies to climbing in a three would slow us down even further and resigned ourselves to simply summiting. 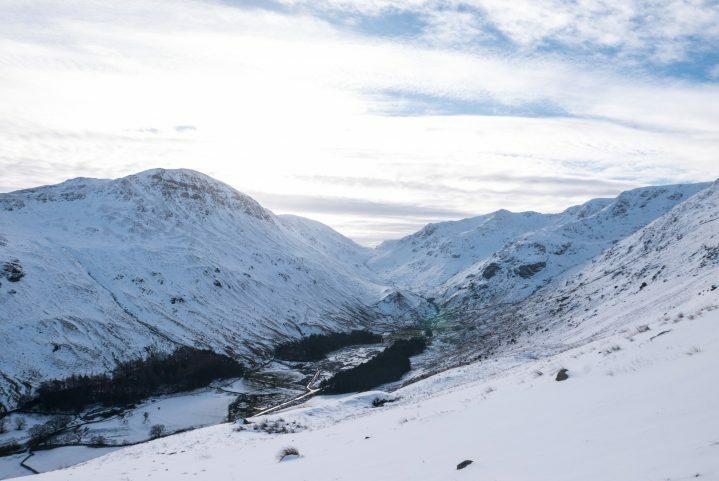 Despite this, it couldn’t have been more ideal conditions, skies clearing, shielded from the heat by the mountain and some lovely little technical sections to the route making for the perfect day of winter climbing! The walk back to base through the snow was the most tiring part, making the beer taste ever so sweet when we finally got to the pub. Thanks Lakes you were great, we’ll be back. Al and James had been planning to climb all week. 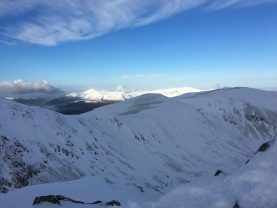 They both arrived at the hut laden down with full winter trad racks and more than 350m of rope between them which they spent Friday evening evenly distributing throughout their rucksack which seemed to take far more than they looked like they could. Off they set first thing on Saturday morning striding off towards their climbing destination – Dollywagon North, with the decision of what route to climb being left til arrival. 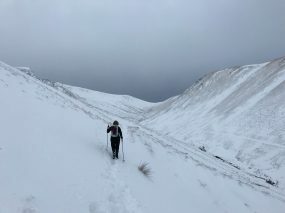 The walk in was hard going, trail breaking through thigh deep snow in places. Three hours later they arrived at the top of the climb and looked down the descent to the start. 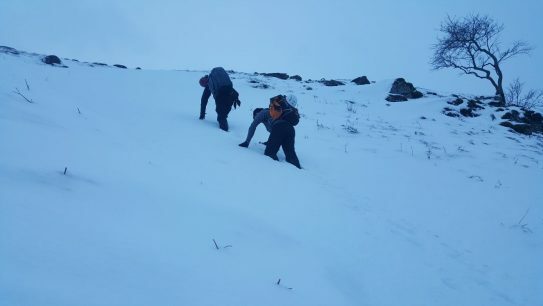 The descent looked ‘horrible’ and all the suitable routes were completely buried in snow. 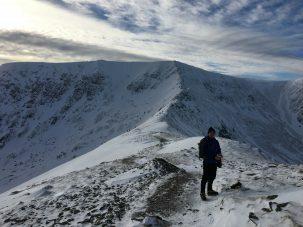 Two other teams were already at the top of the routes and all three teams decided to back off; the conditions suggested that the routes would be unclimbable and no fun, so instead they headed up to the summit of Helvellyn. 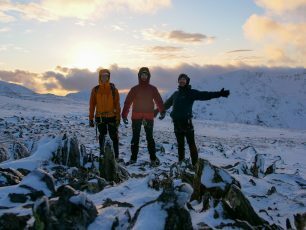 They bumped into the other big group at the summit, stopped for some photos and then made a fast descent back to the valley – both thoroughly enjoying taking their full trad rack rucksacks for a long walk, but returning to the hut first for tea, cake and restocking of the fire. There were only three girls on the trip this year – which is unusual – usually the AMC trips are far more evenly balanced. Due to James and Al climbing together and work commitments meaning Rob not being able to attend the trip he’d organised, Becky, Lucy and Win decided to take the opportunity to have a girls day out – no spas, make up or hair straighteners involved (though there was cake). 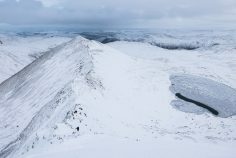 I fancied a change, having been up Helvellyn three times in the last 4 years, so decided on driving a bit further north and aiming for Sharp edge and the summit of Blencathra. Leaving a little later than the early Helvellyn team meant breakfast was a more peaceful affair but we headed off before 8 and were thankful to have not left any later as managed to get in the last lay-by parking spot on the A66. 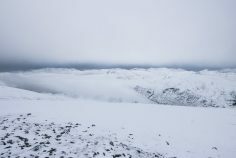 After the initial muddy start, the snow line was quickly reached; for the majority of the walk in we weren’t breaking trail, however there were deeper patches of snow in places but we still made good time getting the bottom of Sharp edge. We knew it would be reasonably busy as there were already several teams on the route, and we’d passed a couple of larger groups gearing up very low down. We spotted a couple of teams starting off on the mixed routes leading up to the edge, but they soon seemed to abandon their climb (presumably due to poor conditions) and seemed to have to wade up towards the shoulder. 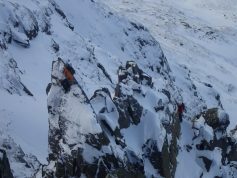 We were keen to not get stuck behind a team of 4 who were roping up at the base of the route so headed straight up having donned crampons and exchanged poles for ice axes. 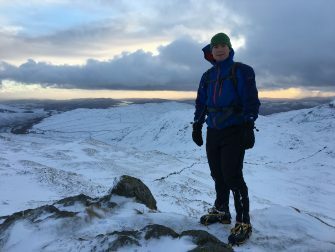 I was particularly pleased to get my crampons out again – despite having spent 3 weeks in Scotland between Dec and March last year the lack of winter conditions meant this was their first airing in 15 months. The ridge was busy, and we stopped at various points due to queuing, particularly up to the ‘difficult step’. Win was on occasion interrupted in her progression due to a small terrier that decided the best place for him to walk was between her legs – not at all off putting! We let the dog, and his human, pass, along with a fell runner dressed in shorts and shoes going at a considerable pace. 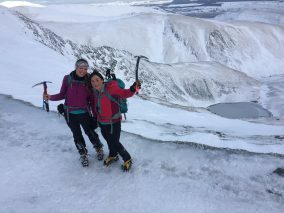 Imagine our surprise when he lapped us again on the summit – seriously fit! As we got higher the weather changed, with the clouds from the morning moving east and bringing a bit of a breeze and blue sky. Once we got to the top of the ridge, the cloud blew in for a bit, but we still had fantastic views back across to the ridge and into the distance – we could just about make out the hills in the south of Scotland in the distance. After a few axe waving photos of team amcgirlsmountaineering we headed for the summit to be greeted by maybe 60-70 others. 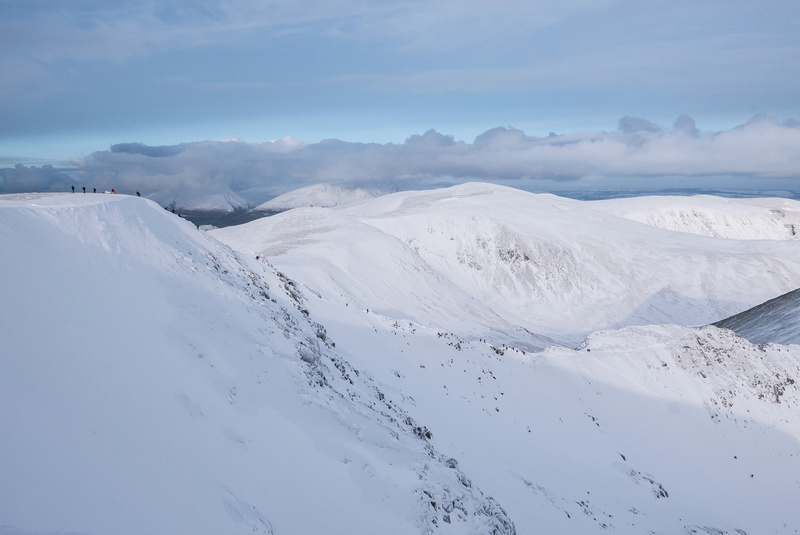 We thought the ridge had been busy but clearly the route up Scales Fell must have been heaving. 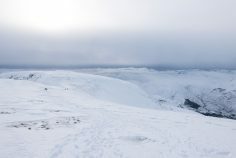 There were dogs, men in shorts, groups in massive silver puffa jackets and several with skis/snowboards. 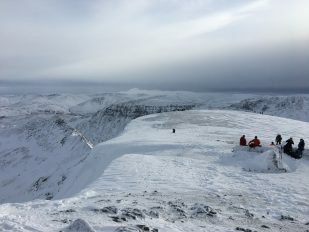 We settled in for a bit of lunch – unusually for me as summits tend to be the last place I stop due to cold and wind. It was glorious and we congratulated ourselves on having had a great day with pleasant company and our enjoyment in lack of the Y chromosome! Looking across, Helvellyn was appearing out of the clouds and we hoped the other groups were having as good a day as we were. 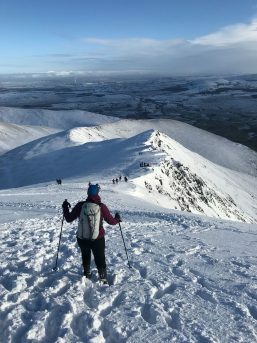 Our plan had been to descend Hall’s fell, however looking down from the summit it was heaving – loads of teams still coming up and lots descending too. Looking over at Doddick Fell there was a significant cornice to get through, so we hedged our bets and made a very quick descent down Scales fell back to the car. As the other teams had planned bigger days out, and it was before 2pm, we decided a trip via Keswick was in order, with an obligatory gear shop stop before tea and cake before heading back to the house. We all decamped to the local pub for dinner on Saturday evening, partially to use the WiFi to see what the weather was doing on Sunday. It looked shocking. Come the morning several people headed straight back to Bristol, not wanting to taint the memories from such a glorious Saturday outing. Team Pinnacle ridge had a quick wander up to the bottom of Catsycam whilst Lucy and James had a wet wander around Ullswater. Win, Henry and Phil did a bit of exploring and finding some caves, but all in all, everyone got pretty wet. 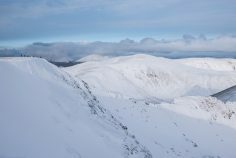 Overall the weekend was fantastic – great weather and conditions on Saturday, with loads of people having full days out. The hut is in a perfect location and is very well maintained and equipped. Pub grub was good and the company cheerful, enthusiastic and entertaining. 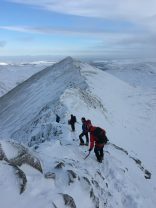 Great to see several new members coming along and a few new to winter mountaineering too. Such a shame that Rob the trip organiser wasn’t able to make it. Looking forward to the next trip to North Wales in a couple of weeks – hope the conditions are as good there.